Exuding sheer elegance, this three-piece set complements existing decor with ease. Dark, rich tones contrast and harmonize beautifully with tempered glass tabletops. The shape is unassuming yet makes a statement of beauty and practicality. Effortlessly enhance your living space and enjoy the subdued magnificence it brings into your home. Bold yet understated, traditional yet contemporary this three-piece coffee table set strikes a balance that only it can. With a wrought-iron inlay, Malaysian rubber wood frame and tempered glass tabletops, this set beautifully combines various elemental sources to suit your tastes. Whether you pine for tradition or prefer a modern design, this trio of tables will easily fit right into your existing dicor. Add some sophistication and class to your dining space with this classically styled 3pc set from CorLiving. The easy to clean padded seats are offered in a rustic brown bonded leather and swivel smoothly on durable high quality bearing plates. Detailed fretwork compliments the beveled glass and warm stained solid wood table top. High strength steel frames and hidden plastic floor protectors provide a sturdy base. Your guests will be sure to admire the classic design and luxurious comfort of this charming 3pc set! Invite friends and family over for a game night with the Bridgeport Poker Game Table set. The set includes the 2-in-1, 48-in diameter game table with 4 matching chairs. The reversible dining table surface quickly turns into a felt-lined game table surface with an easy flip of the table top. The poker surface has space for 8 players and includes built-in drink holders and chip slots. The extremely comfortable, soft, padded game chairs add the finishing touches to this multi-functional table set. The Bridgeport set is crafted from hardwood and MDF CARB certified material finished in a beautiful furniture quality Walnut finish. Some assembly required. 1-Year Limited Warranty. 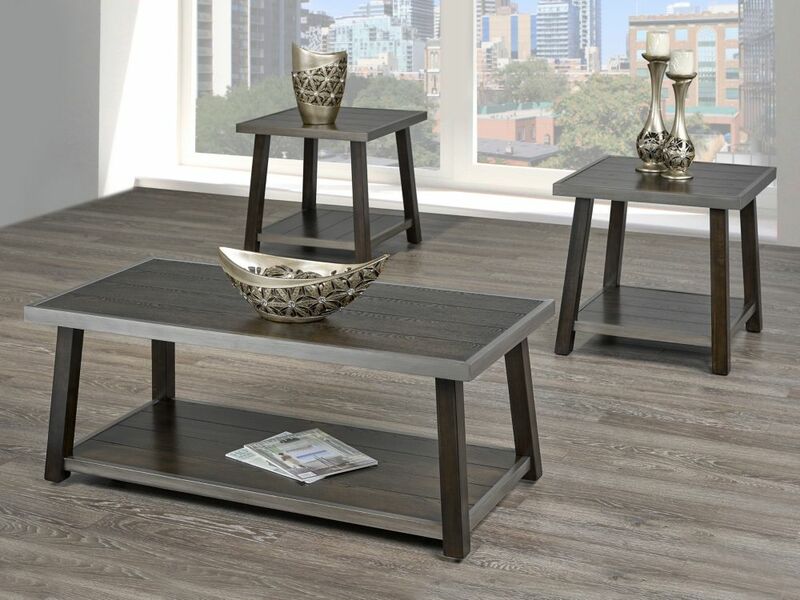 Indira 3-Piece Coffee Table Set, Walnut This three-piece coffee table series leaves nothing to be desired. Solid wood veneer, with a walnut finish and silver trim, is engineered to give each piece long-lasting stability and durability. Two square side tables and the rectangular coffee table each have a large open shelf at the bottom, perfect for storage items like boxes and baskets. The tabletops provide plenty of space for daily living essentials and decorative items. Supported by slanted legs and clean lines, this set creates a unique design to be adored.